A scrollable frame is a very flexible tool and at the same time intuitive. Fortunately, there is no need to invent special symbols for scrolling. An arrow is a recognizable and familiar symbol for scrolling and swiping, its function is to indicate the direction. A frame that scrolls vertically is more common, nevertheless horizontal frames are in no way less useful. Both horizontal & vertical scrolling is used rarely, yet there are lots of ways to use this feature to enrich function, especially the function of children’s and entertainment magazines. An interesting use of scrollable frames from RUSSH magazine. If the whole page is a scrollable frame or interactive element, it’s important not to forget about the static area to scroll / flip the page. 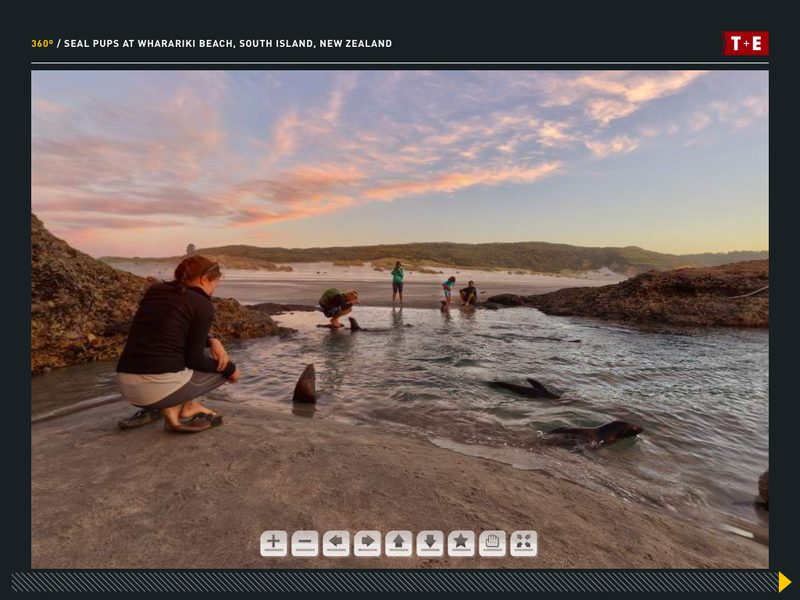 For example this image in Travel + Escape magazine is a 360° panorama and the bottom line is a static area. If a reader scrolls the image he sees an image sequence, sliding the bottom line brings him to the next / previous page.